By Jeremiah Owyang, insight from Charlene Li and Shar VanBoskirk. This is also being cross-posted on the Forrester Marketing Blog. Both Facebook and MySpace have launched profile and network targeted advertising and marketing products. As they both use member interests and the communities which they are part of, trust continues to become key in adoption as information is passed along the network. The sheer size of MySpace’s member base, as well as the thriving local business membership will lead to success. Facebook, which brings a unique solution evolves advertisements to endorsements and encourages members to subscribe to a brand in what we are calling “Fan-Sumers” (an evolution of the consumer). As consumers share their affinities, brands can advertise using trusted social relationships. Trust is and will continue to be one of the most important attributes in the decision making process. How we get information continues to evolve as communities form online organized by individuals with similar interests. Just like in real life, we identify our interests, and are often influenced by opinions and experiences of trusted peers in our communities. 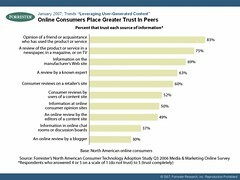 For many, social networking sites embody these relationships and influence how trusted decisions are made. The already active MySpace platform is leveraging their already active member profile pages, encouraging the many small and medium businesses to setup a online storefront and providing tools to make it easy to self-serve advertisements to their customers. It’s easy to make the case that demand and inventory are present. Small businesses can continue to build their online profile on MySpace (many of them already have), but now, because of their familiarity with self-marketing (restaurant, nightclub, and other local businesses and their customers) on Myspace. When friction is removed, efficiency is created. With MySpace’s “Self-Service” ad network small businesese can target ads across a variety of affinities (over 300) and deploy ads on users’ profile pages. These ads, which should (by theory) be relevant and contextual to a user who has self-populated their profile page will have these ads displayed. With marketers already with a strong presence in MySpace this could continue to erode away at early adopter “cool kids” from embracing MySpace. But as cycles have shown, where communities form, marketers follow. These ads, which will conform to IAB advertising standards (sizes) will give advertisers the freedom to create the ads in the style accustomed to the network. Yes, expect more blinking text. As OpenSocial starts to be deployed across MySpace and other partners, expect profile ads to be tied to widgets and vice versa; a fabric of links. I’ve already outlined How to explain OpenSocial to your executives. We know that many members do not make their profiles accurate which could yield inconsistencies in how and where ads are displayed. While MySpace has assured they’re accounting for rogue outliers, expect some inefficiencies in advertisements. We think this to be a win for MySpace, given their great reach, there are millions of users with active profiles, and there’s also plenty of inventory as many small and local businesses that are present will be comfortable deploying ads where their community already exists. Going beyond just profile matching of advertisements, Facebook allows consumers to self-identify with brands and becoming fans. In turn, brands can use these “Fan-Sumers” as endorsers to their own trusted networks, resulting in trusted word-of-mouth. Brands can also self-manage their own campaigns, and there’s some unique opportunities for eCommerce widgets or applications to be part of this formula. For the first time, businesses will legitimately be able to setup profile pages, much like MySpace’s business profiles feature. Next, Facebook members will add these brands as ‘fans’ (much like friends) and this will produce a connection between the parties. Members will self-identify with brands in what we are calling “Fan-Sumers”. Furthermore, this service, called “Beacon” gives third parties the ability to share information on the newsfeed and provides lots of unique opportunities. Sponsored groups will start to evolve into this new form brand profile as this system gets adopted. Once a member has indicated they are a fan of a brand, that brand can choose to purchase SocialAds (from Facebook Sales or via a self-service platform). A unique endorsement of a product or brand will now appear on that individuals news feed or banner or skyscraper ads. Advertisers can purchase social ads target by profile demographics and profiles, as well as by activities done in Facebook. Payment is an auction-based system available to marketers via both CPM and CPC pricing. This self-service dashboard called Insight gives the marketer detailed knowledge how their advertising campaign is working on Facebook. It’s expected that advertisers will have flexibility, control over the type of ads they deploy, in what quantity, and the demographics they want to target. Experiment: Because of the control and flexibility, we recommend to brands that are currently on either of these social networks to experiment and test. Learn how to efficiently manage your campaigns. There’s clearly a trend towards self-service, which provides efficiencies for both businesses and the platforms. To know: Marketing has changed, advertising is no longer a sole-solution. Marketers must also learn how to be part of communities, engage with them, and be part of the conversation. To know: Marketing is now distributed, brands must embrace communities where they currently exist, rather than solely driving them to their corporate website. This digest not only explains what is happening, but why it matters to you. If this was helpful, please pass it on. Love to hear your thoughts, please leave a comment, even if you don’t agree.